No one here has to be reminded to register and vote. But maybe you have a friend or relative who doesn’t always vote, and needs to register and of course vote. To me, this is the most crucial midterm election ever.,whicht should be obvious, but far too many Americans don’t seem to understand. Democratic turnout in midterms is usually abysmal, and this has to stop, not just this time, but every time. In 2010, when Republicans picked up 68 or so House seats, 17% of eligible voters voted for Republicans, and 16% voted for Democrats. That small difference, combined with rural state gerrymandering, led to that dreadful rout. If Democrats simply turned out to vote, this would never happen, and it can never happen again, if we want to have a democracy. Agreed. Lots of good volunteering to be done out there to get people to vote. Natasha Bertrand has the story on the SCOTUS case about double jeopardy that is on the docket for this fall. I commented on that in the last couple of threads. Kavanaugh is the purported 5th vote for it and why they are rushing it. Some hopeful, and some concerning information on the elections. The good news is that to my surprise, Bill Nelson is leading Rick Scott in Florida, and there is at least some chance that the Democrats win the Senate, but Texas is crucial,and that is very hard to win. The worrisome news is that on Nicole Wallace’s show, Steve Israel, a respected Democratic member of Congress from NY, said that he thought the Democrats will win the House, but that with the redistricting which has taken place, the number of seats won’t be close to the 68 or so that the Republicans won in ‘2010, more like the 33 seats that Democrats won in 2006. That is a disappointing number, and more concerning is the fact that this apparently the ceiling for the Democratic Party, because of blatant gerrymandering. And it is a certainly that the Supreme Court is going to allow the most radical type of gerrymandering, even if all the Democrats in the state are in one district. This is how the Republicans expect to control the country forever. The only possible way out is if Democrats win a bunch of governorships and state legislatures, so that they can draw the districts after the next census, which by the way is something the Republicans also plan to rig. There is no enough attention being paid to the state races. People who might vote Democratic for the Congress, but who “like their Republican governor,” are making a terrible mistake, because that is where the gerrymandering and vote suppression is coming from. Tom Perez has been working state races and doing a great job for the most part. There have been a few that have slipped by him but for the most part he’s putting people on the ground and it’s being done at the state level on very active campaigns. People here are running for the legislature against R’s that have not been challenged in a while. We’ve already flipped a few legislative seats. You just keep working. We are not going to wipe out the GOP in one election cycle. This is going to have to be a long term process of making them pay for what they have done to the country. Just taking back the house and getting the gavel can do a ton of damage to the GOP and Trump. The GOP even wrote up their own spreadsheet of the crimes we can investigate. Thanks, and good to know. Taking over some of those state legislatures is so important. Vote and save the Republic! and listen to this amazing girl. 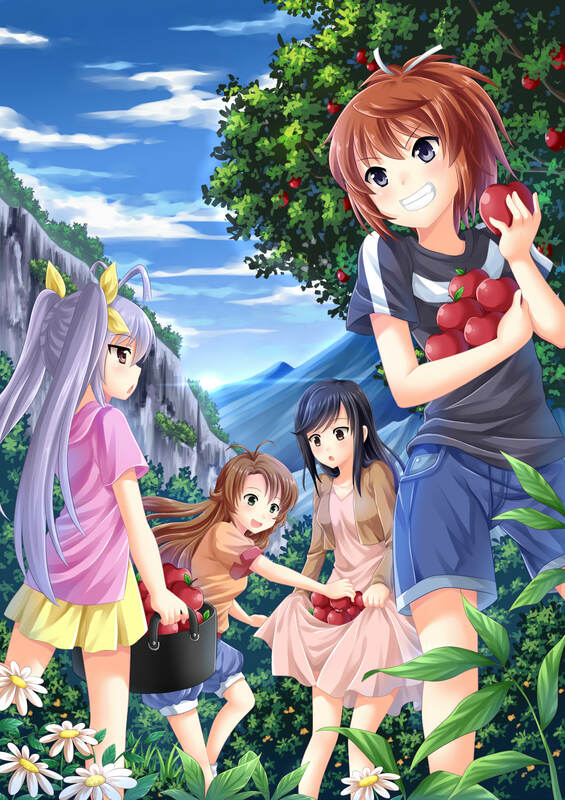 Off topic: (From left) Renge, Komari, Hotaru, and Natsumi of Non Non Biyori pick apples.